How was your labor day weekend? Revitalizing, I hope? I spent the greater part of three days in Kansas City with my favorite bunch of friends. We ate dinner at Beer Kitchen, brunch at You Say Tomato, grilled out on the back porch and enjoyed a leisurely breakfast club (Kansas City edition) with Jordan‘s tasty oatmeal waffles. I even got to—wait for it—put on a sweater at night. A sweater! I’m thankful for a refreshing break full of good company and good food, which was just what I needed. Today I thought I’d share my new favorite easy summer meal: goat cheese and tomatoes on toast. Almost too simple to post, it’s too good to keep to myself. 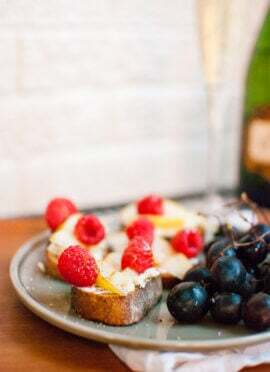 You all loved the strawberry goat cheese toast in my simple summer breakfasts post so I’m hoping you feel the same about this one. 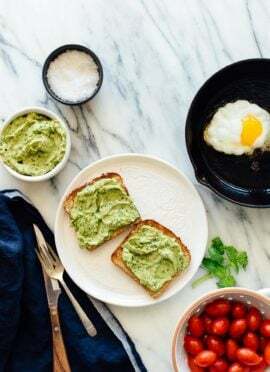 This toast would make a great light lunch or dinner, snack, or even appetizer. With creamy goat cheese, crisp whole wheat bread and fresh tomato, it’s a meal that you’ll never want to end! Tomato and goat cheese on toast is an easy summer lunch or snack. It’s a meal you’ll wish will never end! Preheat the oven or a toaster oven to 450 degrees with a rack in the top position. Slice your bread, if necessary, and lightly brush each side with olive oil. Brush some minced garlic on the top, too. Add a layer of goat cheese, topped with sliced tomato. Brush a little more olive oil and garlic on the tomatoes. Bake for 7 to 10 minutes, until the bread is toasted and the goat cheese is melting and slightly golden. Enjoy! I make something like this! Simple and delicious! Yuuumm :) I make a version of this from a Cooking Light recipe, but you add basil (a favorite flavor of mine)…it’s a twist on the caprese salad that is very tasty. Thanks for sharing yours looks awesome! 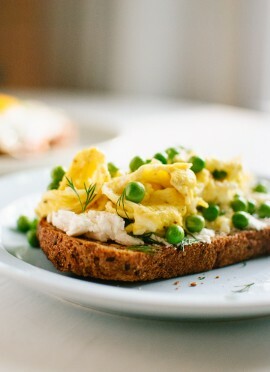 its usually the simple recipes like this that i fall for!! well at least that means i won’t have to keep a long shopping list or spend too much time in the kitchen! the flavours sounds soo wonderful together..garlic, goats cheese and my fav tomatoes! 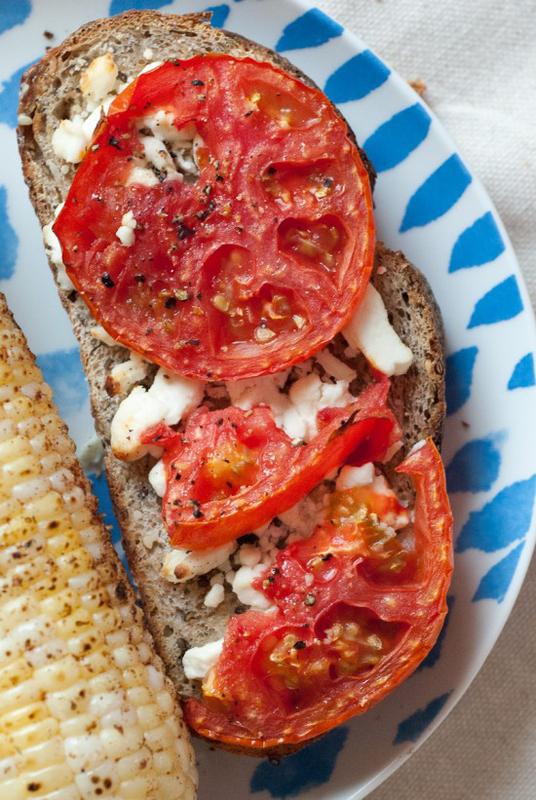 Oh wow, I love tomatoes and goat cheese so much and the combo on this toast looks amazing!! What a wonderful picture! I loved your post and now I will try out goat cheese on toast. Thanks for the share! Yum! I think this will be my lunch today! Thanks for sharing, it looks amazing! Didn’t have goad cheese, so substituted gorganzola left over from the Orichiette and spinach recipe. Otherwise made it exactly as written. My wife and I loved it and it was very easy to make. What a healthy snack! I asked my hubbie to choose one of your recipes for us to make this week and this is the one he picked. I was really surprised at how good it was. I’ve got some kickin’ garlic breath but it was worth it! I served it with some roasted veggies and it was a super quick, easy & tasty weeknight meal. Awesome! Glad you both enjoyed it. Sometimes simple is best!